This is a simple binary clock, kinda like those geek clocks found at some stores. I wanted one but didn't want to buy one. Hmm what to do? DesktopX was the solution. After few hours of work, here it is! Geeks, you think the physical binary clock is fun? This has even more features! You can show this in 3 modes. Big, this one includes clock for non-geeks. Small for geeks like us. 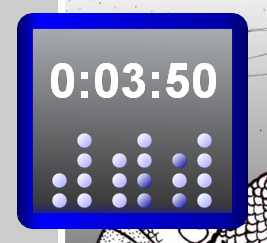 The third mode, True binary clock, is for super-geeks that want to show clock in true binary numbering system! Do a search in the DX object for "binary" to see some other examples of binary clocks with more intuitive interfaces.